Majority Cow vigilantes doing well. Muslims must not be involved in cow smuggling or slaughtering, says BJP leader and MLA in Rajasthan. Ram Singh Bhudev | HENB | Alwar | Dec 24, 2017:: Following the incident of a group of self-proclaimed Cow vigilantes severely beat up one 46-year-old alleged Muslim cow smuggler in Ramgarh area of Alwar district, the local BJP MLA Gyan Dev Ahuja said people who are found to be involved in cow slaughter and smuggling may be killed in a similar fashion. without other option. 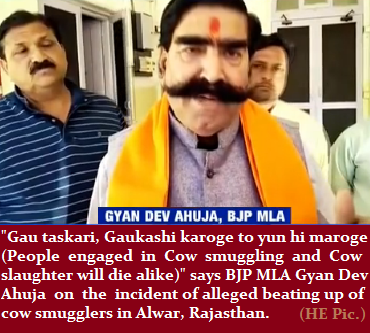 Speaking on the attack, the BJP MLA from Ramgarh constituency in Alwar said he believes those who indulge in smuggling and slaughter of cow will meet the same fate. “Mera siddha kehna hai gautaskari karoge ya gaukashi karoge to yunhi maroge (I say it clearly that if you indulge in cow smuggling or slaughtering, you may be killed so)” he said while speaking to local media persons. He further said since cows are revered in the country, why would anybody would kill cows to hurt majority people of this land? “Muslim Cow smugglers from other areas pass through Alwar and when are stopped by the Hindu villagers, smugglers open fire. Why do these smugglers come here? To get beaten and trashed? Why the cow smugglers keep fire arms with them?” he said, adding that there is a considerable anger among majority people against smuggling of cows. The defender of Cow vigilantes and the local MLA Gyan Dev Ahuja demanded strict procedures to punish all cow smugglers and slaughterers under more strict laws. He expressed his satisfaction for the activism of the Gauraksahkas (Save Cow Activists) in Rajasthan. “Muslims must not be involved in Cow smuggling or Cow slaughter and not to violate the peace and harmony in Rajasthan”, Ahuja added. The police on Saturday had said that they had received a tip-off about a mini-truck transporting cows heading towards Ramgarh and set up barricade. However, the vehicle broke through the barricade and sped off. Residents of Yadav Nagar village in Khilora gram panchayat spotted the truck and attacked the three occupants. Two of them managed to escape, but Zakir Khan was caught by the mob and bashed up. Meanwhile, a police team in pursuit of the truck arrived on the spot and rescued him. Police identified Khan as a resident of Utawad in Haryana’s Nuh district. He was admitted to hospital with head injuries and a fracture in legs. Bharatiya Janata Party MLA Gyan Dev Ahuja has courted a controversy by saying that people who will smuggle and slaughter cow will be thrashed to death. Ahuja’s statement comes days after a man was beaten up by a mob in Alwar district for allegedly smuggling cows.The statements like is adding fuel to the fire and it will create a tense condition in the country. This entry was posted on December 25, 2017 by hinduexistence in Animal Cruelty in India, Anti-Hindu, Attack on Cow Resources, Attack on Hindu Sentiments, Attack upon Hindu Sentiment, Ban Cow Slaughter, Ban Cow Slaughter in Bharat, Conspiracy against Hindus, Cow Protection, Goraksha, Hindu Demand to Ban Cow Slaughter, Hindu Demand to Stop Cow Smuggling and tagged Cow smuggling and slaughtering may get you killed, cow smuggling or slaughtering in Rajasthan, Cow Vigilantes in Rajasthan, Majority Cow vigilantes doing well, MLA Gyan Dev Ahuja.